Sapsis Rigging Inc. has announced the addition of the Rope Access harness to its family of harnesses in the ProPlus Fall Protection line. 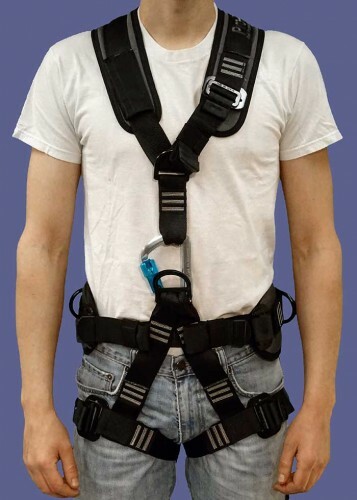 Designed by Bill Sapsis specifically for entertainment technicians, the ProPlus Rope Access harness enables a worker to safely access difficult locations as well as provide fall arrest protection. Bill explained: “Entertainment technicians work long hours in difficult locations and I wanted to offer a harness that is as light and comfortable as possible without sacrificing any of the features that entertainment technicians have come to expect from a ProPlus harness. The Rope Access harness weighs just five pounds and meets all applicable OSHA regulations and ANSI/ASSE Z359 standards for personal protection equipment (PPE). 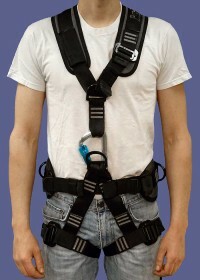 The Rope Access harness features five D-ring attachment locations including the preferred dorsal fall arrest point on the upper back, two hip rings, a waist ring and a sternum ring. Two convenience loops at the hips keep tools in easy reach. It comes in sizes from XS to XL to fit waists from 28" to 52”. The list price for the harness is $330.00. It is available in any colour you want as long as that colour is black! The ProPlus Rope Access harness will make its official debut in the Sapsis Rigging booth #827 at the USITT conference in Cincinnati, March 19-21, 2015.